Turns out, it doesn’t matter who won the patent wars because there’s a new (possibly) must-have phone on the market: the OwnFone. Created specifically for those users who couldn’t be bothered with a feature-rich smartphone, the OwnFone is programmed for the sole purpose of calling the people you talk to the most. Numbers aren’t stored on an internal storage device either. Rather, to make the phone as simple as possible, numbers are stored in the cloud and retrieved when needed. Launched first in the UK, the super simple device allows you to configure up to 12 contacts. The names of each contact will then be printed on a large white button, push the button and it will call that contact. As far as features go, that basically sums it up — though it’s worth mentioning that braille and photo buttons are in the works. And just to be clear, there is no keyboard or screen on the device. The OwnFone has the dimensions of a credit card, weighs 40 grams, and manages to be a slim 7mm thick. The size is great if you need a back-up device for when your main one drains battery. You can even forward your main number to your OwnFone if you want a fairly-disposable phone to take travelling. The look of the device is left up to you. First, you can choose from 2, 4, 8, or 12 contact layouts. Then you choose from pink, blue, green, orange, red, or black for the main color of your OwnFone. Finally, you can choose to leave it plain or add an image or pattern to customize it further. Besides catering to smartphone-haters everywhere (they exist, right? ), the OwnFone seems like a perfect fit for kids to carry around without having to add another expensive mobile contract to the monthly bills. Alternately, less tech-inclined adults could definitely benefit from a device that does one thing and does it well. Plus, it’s easy on the wallet with a meager price tag of £55. Throw in free replacements and you have a pretty stellar deal. Unfortunately, if all of this sounds like your cup of tea, the OwnFone is currently limited to the United Kingdom and Northern Ireland. 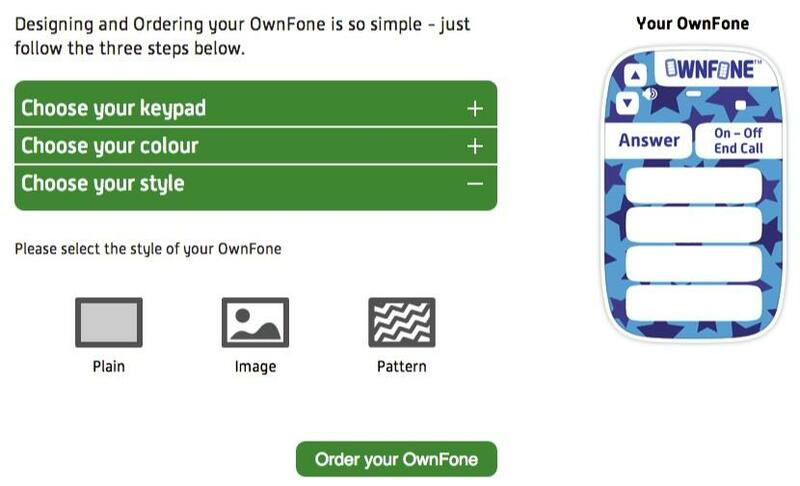 Would you consider ordering an OwnFone? What would you use it for?